It has been brought to my attention (via Comments) that I have mistakenly confused one chord for another, and furthermore that I have committed this act in one of my songs in my 2014 song book. I now realize that some players take their ukulele chords SERIOUSLY and others are just like, laid back, y’know? “It looks like C plus A minor.” “It’s the G7 chord moved over one set of strings to the 4th, 3rd and 2nd.” “I bar everything so I don’t have sore fingers.” And more, oh yes! I have heard alot about how other players get by and get around. The problem chord is in Drop Baby, Drop. I had it from the MUD4 Festival I attended in Lansing, Michigan last year. They had the chords used as A, Bm, Cm and E7. How was I to know that it was not actually Cm? The chord actually used has been identified as C#m. I did notice when I went looking for chords for Grow Old With You that it was the same key and used the same chords, except for one: C#m. For Drop Baby, Drop I changed it to Bm7 because I never play the 4th string in the 4th fret for the Bm chord. So I just looked up whatever the name would be for barring the second fret, and I got Bm7. 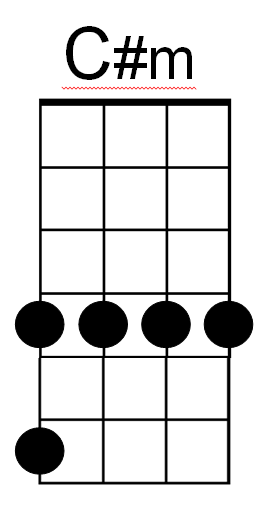 Logically, that would mean that the 4th fret barred would be Cm7, right? Wrong! Oh, so wrong! This is NOT C minor. 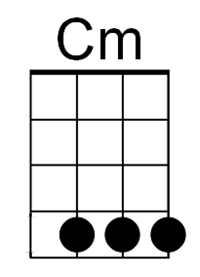 This IS the correct Cm chord. However, this is NOT used in Drop Baby, Drop or Grow Old With You. Now, herein lies an even bigger source of confusion. Chord charts. They are a uke player’s best friend – or are they? The Kiwi one I am so fond of, has two different names for those chords, and also has a completely different configuration for C#m. Great! So, WOW do I ever have a sheepish grin. I just spent a couple of days pouring over chord charts trying to figure them out. The easiest way to insert chords into Drop Baby, Drop is to use D6 and E6. Furthermore, Bm7 and D6 are the same, and E6 and C#m7 are the same as Dbm7. Wow: I just play them as 2nd fret barred and 4th fret barred! The chords I prefer for Grow Old With You are A, Bm, C#m, D and E.
So the chord charts definitely contribute to chord confusion and chord name confusion.The one I am not using in the future will be Ukulele Chords by Ron Middlebrook. The only useful part of it left is the information for the Intros and Endings. The Kiwi online chord is still my go-to choice for chord boxes. Sorry everyone! Corrections are underway!